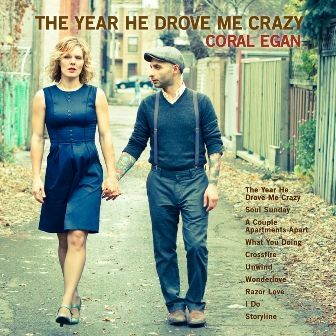 The Year He Drove Me Crazy is the new album from singer-songwriter Coral Egan. Written and recorded in collaboration with producer/engineer Tim Gowdy and an all-star cast of Montreal musicians (drummer Robbie Kuster and bassist Mishka Stein of Patrick Watson's band, pianist Jon Day, beatboxer Jason Levine and guitarist Warren Spicer of Plants and Animals) the album represents a new approach to song writing and stylistic departure for the Juno nominated and Felix award winning artist. Retaining her distinctive jazz-inflected vocal style, Egan has woven California soul, singer-songwriter and indie-rock influences into an album dealing with the complications of blended families and the dizzying effects of romantic love. The Year He Drove Me Crazy reaffirms Egan's desire to share her highs and lows with her public, while embracing a spirit of spontaneity sure to win her a whole new set of fans.